Coordinator of Government Activities in Territories succeeded in ceremony; Eizenkot speaks of security tensions and Gaza situation. 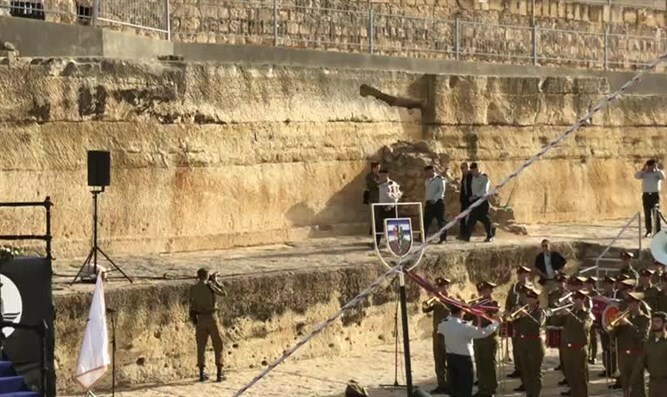 An exchange ceremony for the Coordinator of Government Activities in the Territories (COGAT) took place in the presence of Chief of Staff Gadi Eizenkot at the grave of Samuel the Prophet north of Jerusalem. During the ceremony, Maj. Gen. Kamel Abu Rukun replaced Maj. Gen. Yoav (Poli) Mordechai, who served in the position in recent years. Eizenkot revealed that in recent weeks security forces have been required to deal with kidnapping attempts and near-penetrations into southern communities. Eizenkot addressed both the tense security situation in the south and the issue of returning IDF soldiers held in Gaza. "The return of Hadar Goldin and Oron Shaul to Israel will improve the lives of the residents of the Gaza Strip," the Chief of Staff promised in his speech. During the ceremony, Mordechai turned to the Goldin and Shaul families and said, "The journey isn't over, you won't go alone; I won't leave you."